Your request has been successfully submitted agents are now working to find the best coverage for your needs. You will be hearing from somone on our team shortly. Thanks again for considering our independent, family-owned and operated insurance agency! If you are looking to add a personal touch to your personal insurance, Martin can help. Martin Insurance Group is a family-owned and operated full-service insurance broker that has been serving the insurance needs of individuals since 1983. As an independent broker, Martin is not tied to a single provider, so we are better positioned to help you get the insurance that is right for you. You can expect a higher level of personal service. 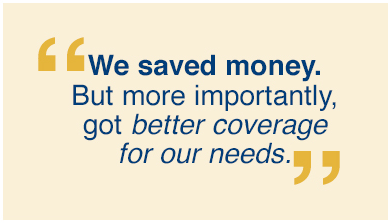 When you consult Martin for your insurance needs, you’ll get more than someone who just quotes a policy. You’ll get an experienced insurance expert who cares more about getting you the right insurance for your needs than they do about making a sale. Since we’re an independent agency, we have access to a wide selection of insurance companies, allowing us to find the right policy at the right price for you. We work with top-rated, financially sound insurance providers that are committed — just as we are — to providing quality and responsive service. We can insure your first townhouse, help protect your investment as you upgrade to a new home, and even put in place the coverage you need for a summer retreat at the Jersey Shore. Martin is headquartered in New Jersey, and has customers across the country.